Did you ever stop and think about the situation our ancestors faced when they wanted to build a mill and needed to dam a watercourse to provide the water power for it? In so many cases, they didn’t own the land on the other side of the watercourse from where they wanted to put the mill. That land clearly would be impacted if the dam needed for the mill was erected. And landowners upstream and downstream might be affected too. But the economic development of the community depended on the development or placement of the mill. The answer, at least in the Territory of Nebraska, was the writ of ad quod damnum. Yeah yeah yeah – – The Legal Genealogist is poking around in statute books again. This time, in the last territorial statutes of the Territory of Nebraska, since I’ll be headed out to Nebraska in just three weeks for the Nebraska State Genealogical Society conference April 27-28 at River’s Edge in Columbus. Mailed registrations for the conference have to be postmarked by Monday, April 9, and online registrations paid by PayPal should be made by Monday as well. Later registrations should still be accepted but there’s no guarantee that lunch or handout materials will be available. And this is one conference you don’t want to miss: in addition to my sessions on conflicting evidence, women and the law, immigration, coroners records, and DNA ethics, there are great breakout sessions by other speakers ranging from World War I research to Nebraska digital newspapers and even a demonstration of grave dowsing. It’s going to be a great conference, and I hope to see you in Columbus, where there are some dams nearby that may originally have been impacted by that problem we began with: what do you do when you want to dam the river and you don’t own the land on the other side from where you want to put the dam? Nebraska’s territorial statutes provided the answer for early residents of the territory: a legal mechanism for allowing the economic development that was so critical to the territory while compensating the landowners who were hurt by that development. And that was the mechanism chosen by the Nebraska Territorial Legislature. So there you have it, a straightforward legal system for resolving the problem of the damn dams. And, of course, a system guaranteed to create records — thus warming the cockles of a genealogist’s heart. And, no, actually… the territorial and early statehood district court files aren’t online. 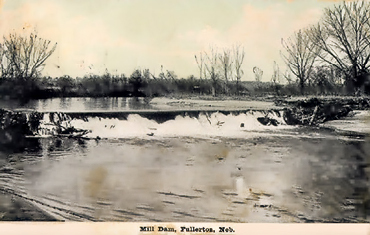 Image: “Mill Dam, Fullerton, Nebraska 1900s,” courtesy of FamilyOldPhotos.com.